I will pretty much drink a white wine with anything. Steak? No problem. BBQ? Why not? I don’t think it works the reverse way; Cabernet and oysters sounds awful. You also have to think about the setting and the company: A 100 degree day in Seattle, fans blowing, lack of AC, an oven far enough away to make using one only slightly insane, and the company of a charming, interesting, and attractive woman. So you enjoy your BBQ chicken pizza, and savor a crisp, dry, racy Sauv Blanc from California. Yes, California. 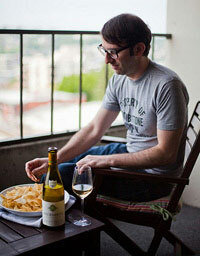 Even this insufferable European wine snob can enjoy a white from California. The nice thing about the Pomelo (from Randy Mason) is that it is devoid of those nasty green-bean aromas and flavors of unripe Sauv Blanc. I love the name, the label, the screw cap, and, yes, the wine. It’s funny that this has been a wine I have recommended frequently but it had been well over a year since I drank it. Thankfully, it was as charming a domestic white I can ever recall drinking. A truly cheerful and fun wine. people have their own taste. Some people go with BBQ, some with Pizza. Pomelo, no doubt, is a good brand to go for. Me too like the absence of unripe New Zealand suav blanc from it. I generally prefer buying cigars and then go for Pomelo with that. The combination has its own aroma.